Is there an area in your home that you can’t live without? Is there a space in your home that you need to function properly? For me, this is a mudroom. I NEED a drop zone for book bags, purses, keys, shoes, and all our JUNK! With two kiddos running around, my house is rarely a clean and tidy space. That’s why I rely on a entryway or mudroom to organize the chaos. 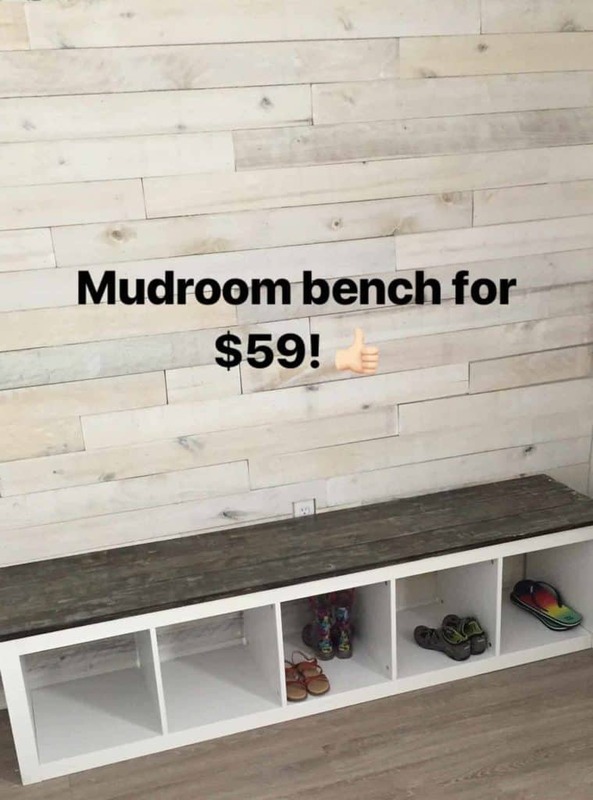 When we moved in to our rustic beach cottage I knew my first project needed to be project mudroom! 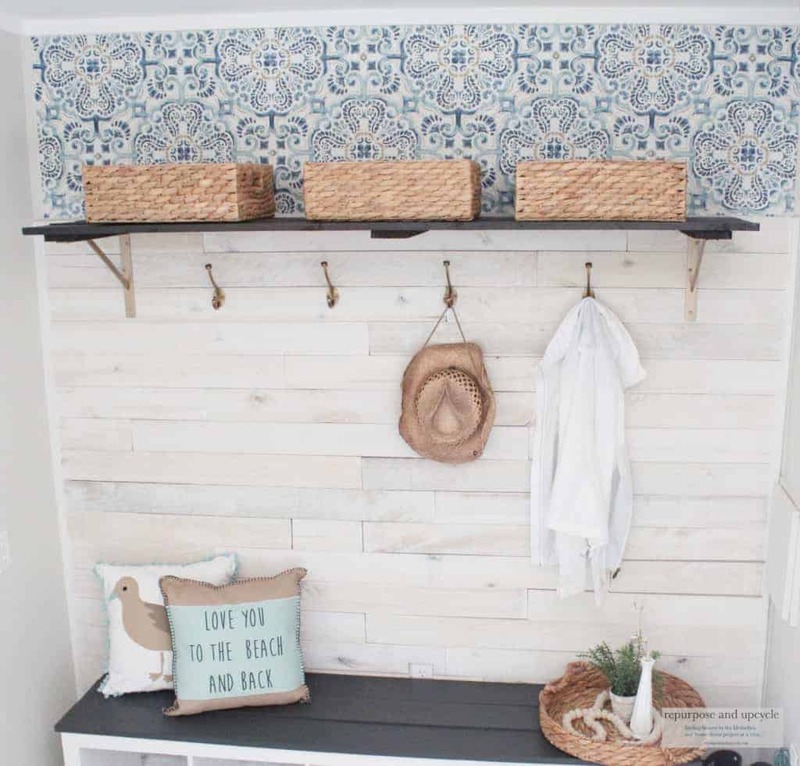 I wanted to add a little more color and rustic charm to my budget friendly coastal cottage mudroom. 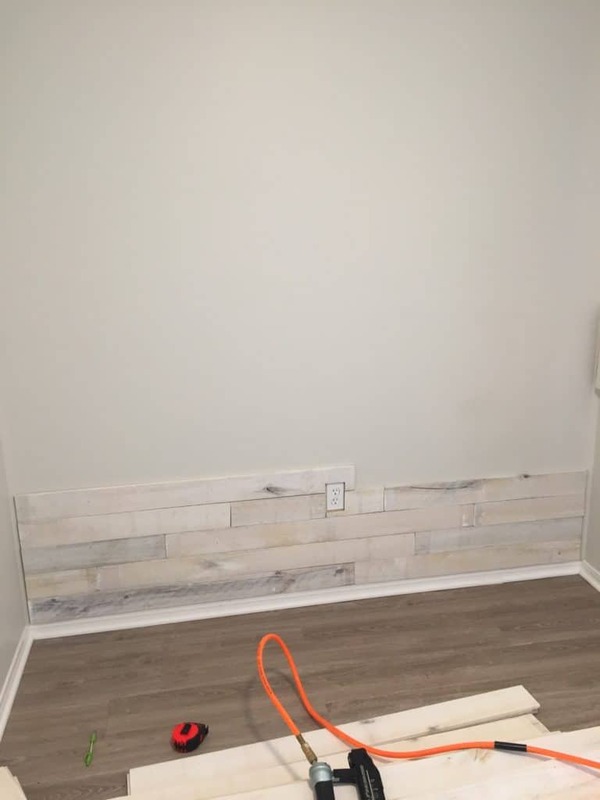 Unlike my last DIY modern farmhouse mudroom makeover (you can see it HERE), I wanted to add more texture and color. Note: this post contains some affiliate links. This means that if you purchase from one of these links I will receive a small commission, but I promise that you will not pay anymore for the product. As always, I needed to create it on a budget. 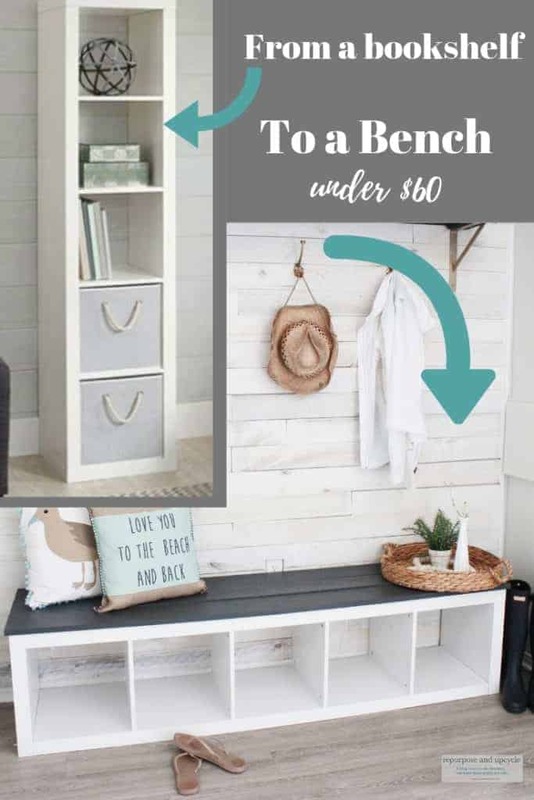 So when I was walking through Walmart and saw a $59 shelf that I could repurpose as a bench, that’s when I knew I had my coastal cottage mudroom plan. 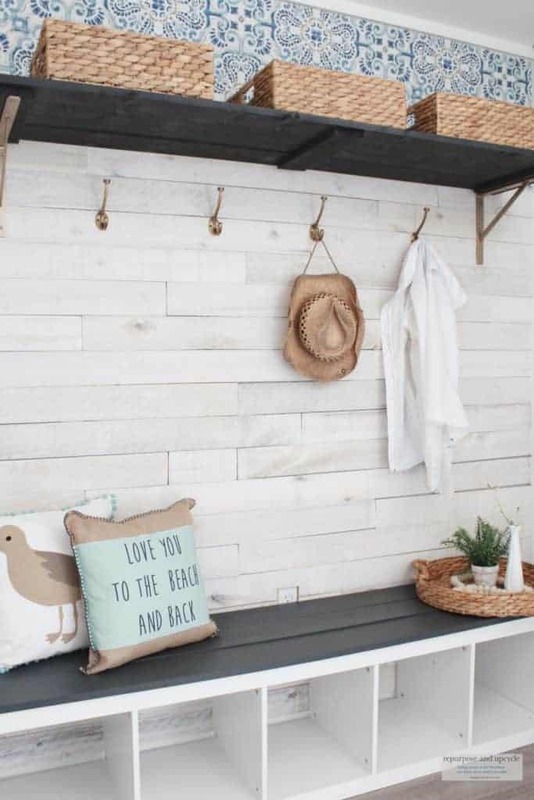 This beach cottage mudroom is just a wall that I will transform into a more functional space on a budget! The first thing I wanted to add was wall boards. Wall boards add so much dimension and character. I happened to have a few left over from a previous wall board project in our old home. 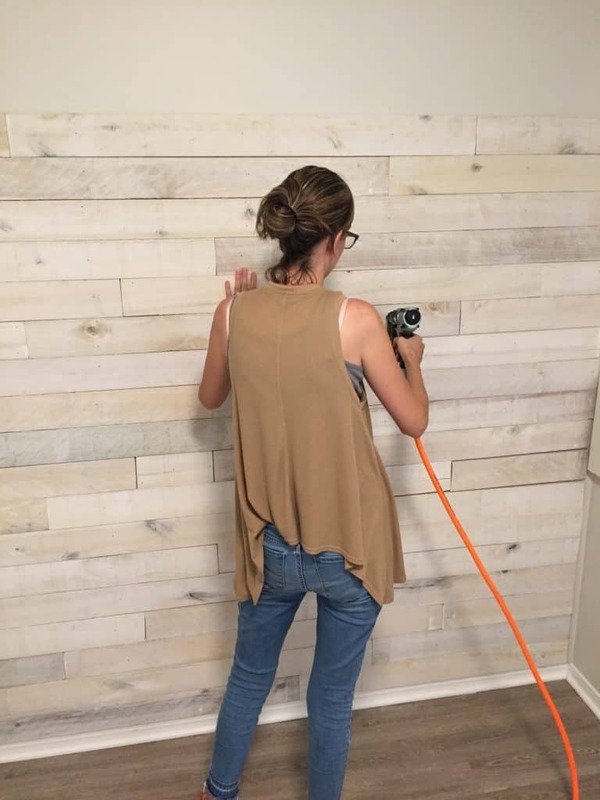 These wall boards are white washed hardwood and are from Weaber Lumber. I love how authentic these boards are. After adding the wall boards I added wall paper. I know I know, what is it with wallpaper? Hear me out. Wallpaper used to be a JOB to put up and an even bigger JOB to pull down. Guess what? Most wallpaper today is peel and stick! Yep, this means it’s no mess to put up and even easier to pull down. Below is the wallpaper I used. I love it because it has just enough blue to add color to this space while keeping the “vintage” feel. Now it’s time to add the $59 bench! I loved the functionality of the shelf, but ultimately I felt like it still looked like a “shelf.” It just so happened that I had some old wood I previously used as a headboard in our old home. I thought I could lay it on top of the bench to make it look more finished. Lucky me, it fit perfectly. I still had 3 planks left over, so I decided to build a shelf! After I made the shelf, I painted the wood. 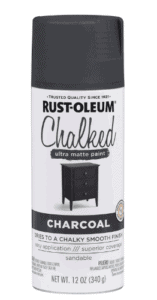 I decided to go with a great spray paint that I’d used before for a chair makeover. Next on the to do list was hardware. I wanted to go with an aged gold color. I found the perfect hardware for a fraction of what you pay in the store! See all the sources at the end of the post. I spray painted the hinges that hold up the top shelf with my favorite gold spray paint below. The last thing I did was add a little moulding to both sides of the wood boards to make it look finished. 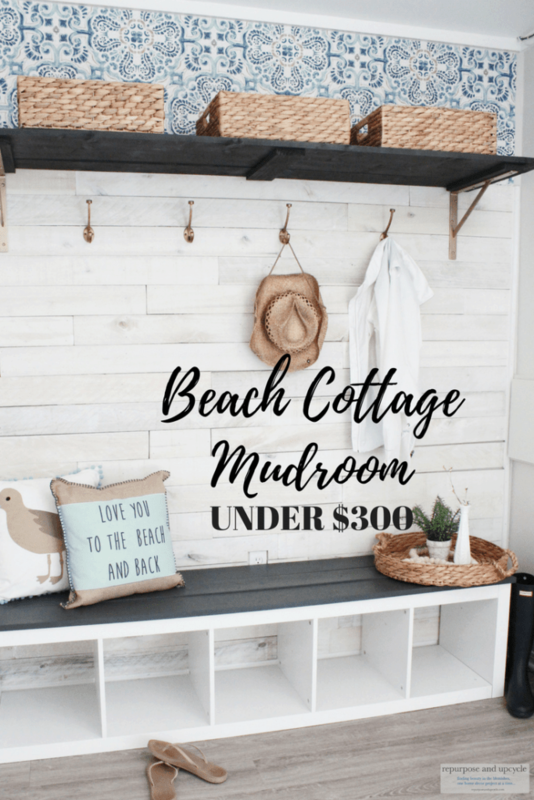 For those of you that would prefer to see a video, check out my budget friendly beach cottage mudroom makeover below. This video is from YouTube. I would love for y’all to come follow with me over there too! 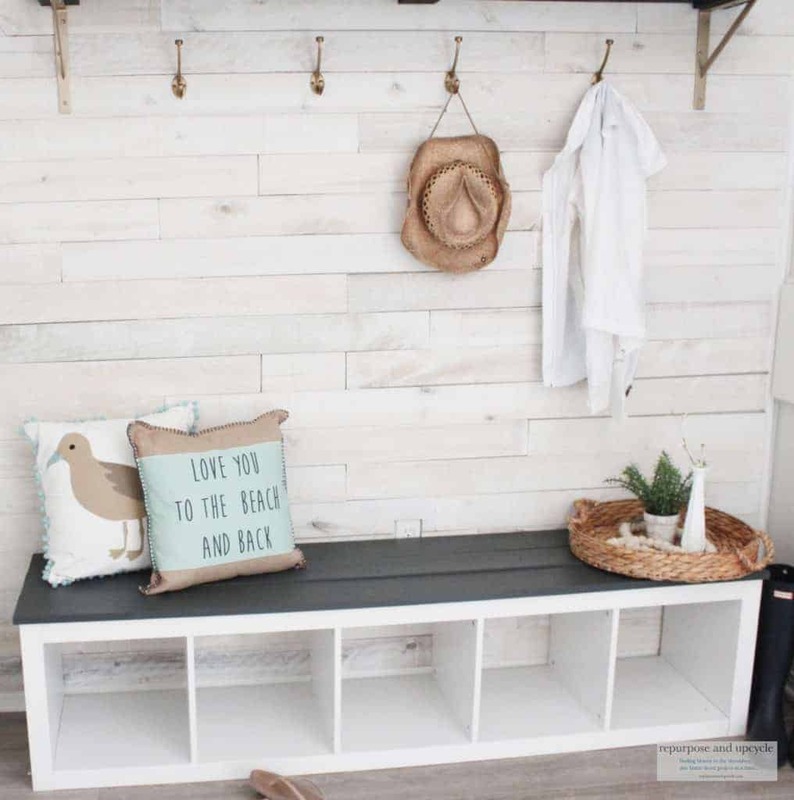 Here it is; my budget friendly coastal cottage mudroom. I’m so glad I have a functional mudroom space again! Wall boards (these were provided by the Weaber Lumber, so I did not pay for them. 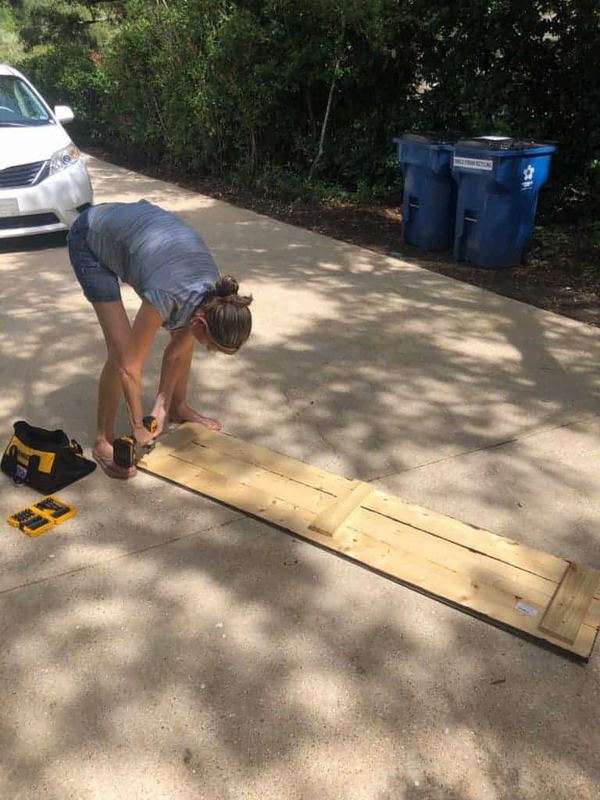 You could make your own by ripping plywood sheets for under $40 at the most! You can also find a realistic looking wall board decals (sort of like wallpaper) HERE. We will say that the cost for the boards (on the low end) is $50. I already had the shelf and bench wood on hand, so that didn’t cost me anything. I purchased Pine boards that were about 1″ by 6″ wide and had the hardware store cut them to fit. Feel free to please Pin the image below to Pinterest if you want to save it for later! I’m so excited to finally have a dumping ground again. 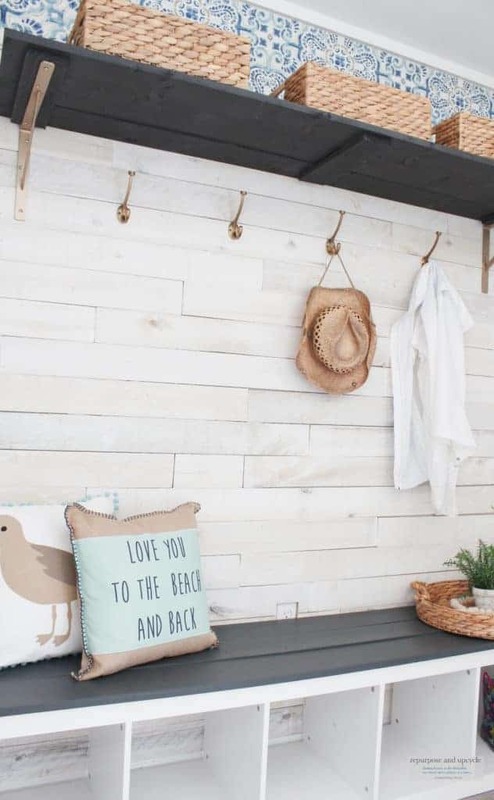 This budget friendly coastal cottage mudroom is exactly what our rustic beach cottage needed. 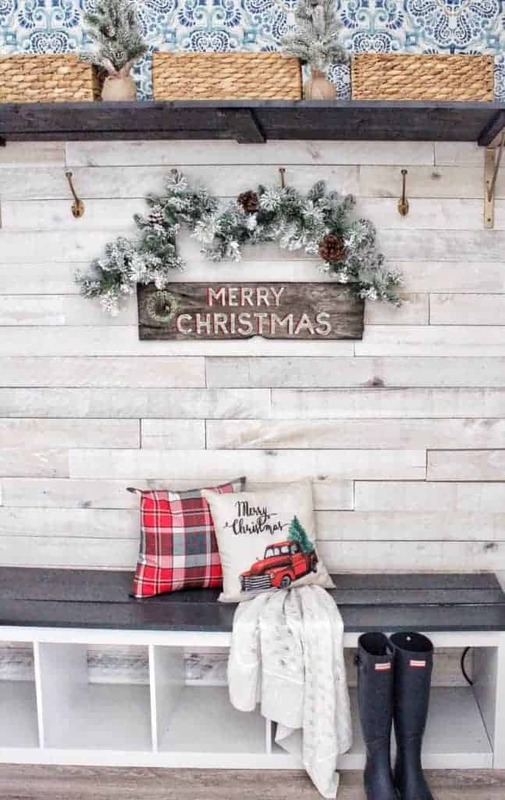 Just in case you needed some Christmas mudroom inspiration, here ya go! Nice! That’s a great cost for what you did there! I love that coastal feel in your mudroom…I wish we had a dedicated space that I could use for a mudroom *dreams*. Thank you Marissa! All it takes is a simple wall to create this! It turned out so nice. I wasn’t sure about the wood on top of the bench when I saw the first image, but it all came together beautifully! Thanks Donna! I think after I painted the wood on the top it blended better. You did a beautiful job! And for only $300! Wow! 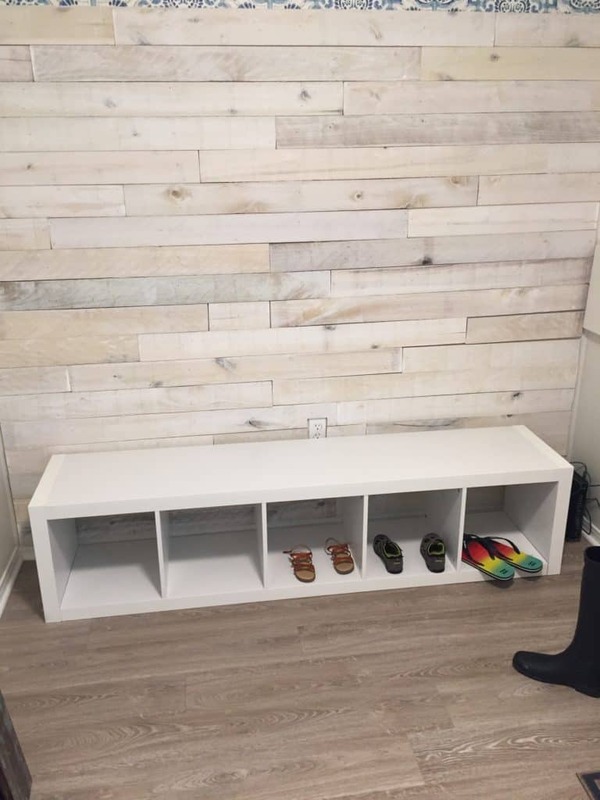 I love the wall boards and the bench! Definitely pinning for later! It turned out wonderfully and so very functional! Thanks for sharing with SYC. I LOVE this! It looks so good. 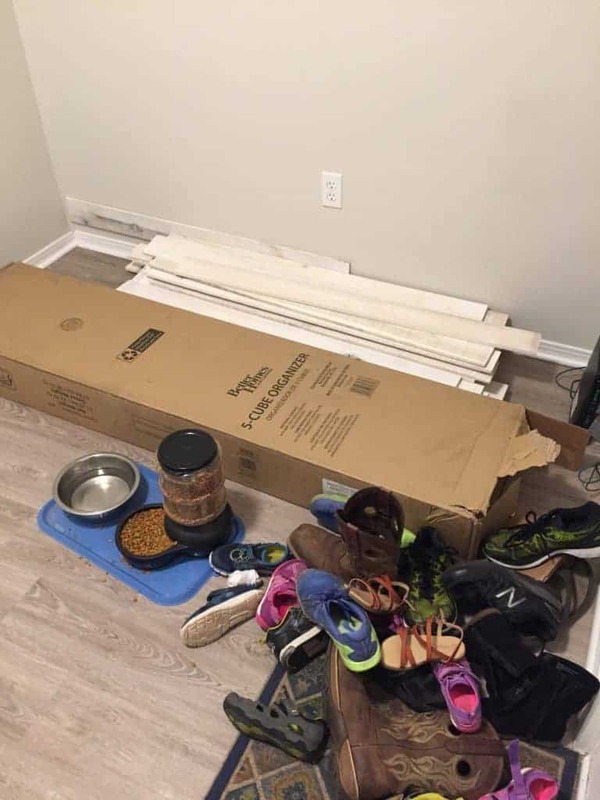 I’m not sure I wouldn’t stop my family from putting their shoes in it and using it as a little escape for me!! This looks fantastic. I really like the wallpaper, peel and stick. I will need to check out. This is so easy and budget friendly affair to look for. Good to know about it. WOW! Everything turned out so great. It’s gorgeous and featuring when my link party opens up! Thanks Lindsey, this is exactly what I want for my mudroom. Quick question, can I just use nail liquid alone without air nailer? That’s a good question. I think it depends on how thick of wood you are going to use. The boards I used are real hardwood and pretty thick. If you use a real thin and light wood I think you could get away with it. I hope this helps!